Satellite equipment specialist Newtec and Middle East satellite operator Arabsat have signed a new multi-million Euro contract, expanding their long-term partnership. Arabsat will deploy a Newtec Dialog platform with a variety of Newtec’s DVB-S2X Wideband modems. The specific modem used for each customer will depend on the market being served, with Newtec’s portfolio providing vertical-specific solutions to deliver the best connectivity experience for any satellite application. Newtec Dialog is a multiservice VSAT platform which enables operators to build and adapt satellite networking infrastructures according to specific needs. With Newtec’s modems, it provides a choice of three return technologies, including MF-TDMA, SCPC and Newtec’s Mx-DMA which combines the best of both to provide dynamic bandwidth allocation with a high level of efficiency, according to the company. “Expanding our partnership with Newtec in this way will help us meet rising market demand for high-throughput and high-performance services, pushing the boundaries of what is available today We chose to partner with Newtec after careful consideration of the market. We are confident that Newtec’s proven expertise will enlarge our addressable market and maximise the benefits of HTS to achieve highest efficiency and throughput. This helps us provide the high-quality, cost-effective services our customers expect,” said Khalid Balkheyour, CEO at Arabsat. “Our Newtec Dialog platform has a strong association with maximising revenues to achieve the highest profitability, and with minimised risk, especially when being used to maximize the benefits of HTS networks. 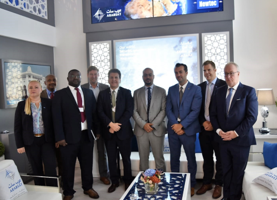 We are proud Arabsat has chosen us to enlarge its addressable market and serve its most demanding customers, building on our long-term and very valued partnership,” said Thomas Van den Driessche, CEO at Newtec. Newtec is exhibiting at IBC in hall 1, stand A49, while Arabsat is exhibiting at stand B38, also in hall 1.